We’ve talked about signs and symbols quite a bit here. Today the Universe says that it’s time to discuss them again. But now, with some additional ………. Like, how serious should we take them? What do they mean, and are the definitions always the same? Because, it might be different, each instance. Almost every individual circumstance could have a singular and unique purpose or point. One thing to think about is that sometimes these messages may not even BE for us. It’s entirely possible that this could be a situation where we’re supposed to pass along information. When in doubt, ask. 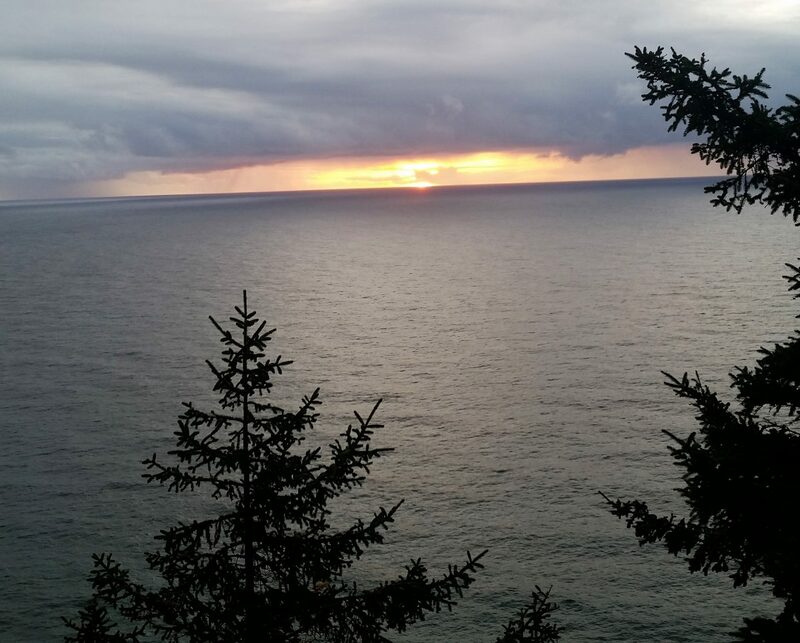 It takes no more than a few moments to sit down, become still and quiet, and listen. Listen with an open and easy mind. Listen and pay attention. When we allow our brains to rest and our hearts to hear, we are much better at understanding and discerning. Another very effective way to “hear” is to have some soothing or inspiring tunes playing while we turn our busy minds off. And, how not at all coincidental, here’s this daily draw, appearing precisely where we need it to. Music is a powerful ally on your spiritual path, as it serves to boost your manifestation powers. Music is part of the invisible realm, and is of a higher frequency than that of the physical plane. It wraps us in a protective shield to guard us from negative energies. It also lifts our emotions and thoughts to joyful levels. By drawing this card, you are urged to play any type of music that suits your mood, as often as possible. Move your body to the music, and breathe in deeply as you listen to it, drawing in the energy of each note. 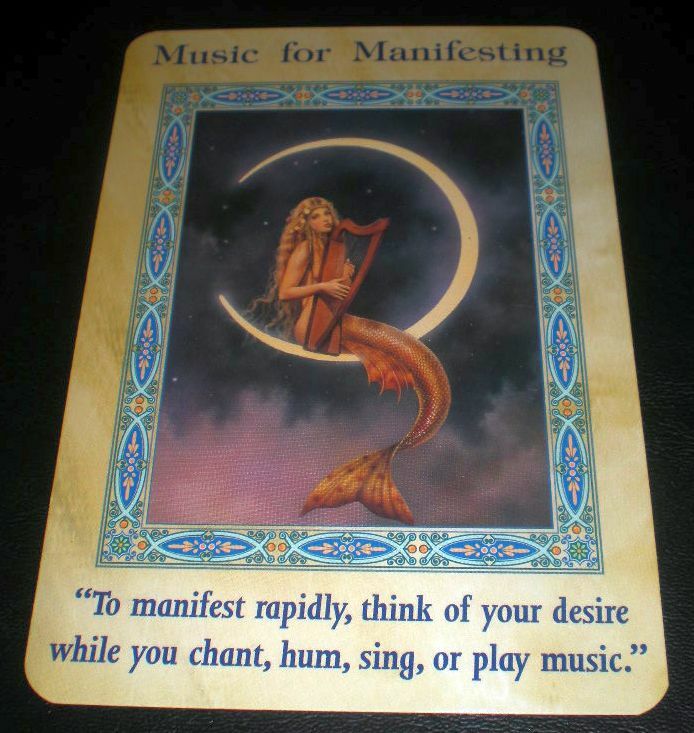 Use music as a manifestation tool. First, sit quietly and think of your desire. Imagine that your dream has already come true, and feel that reality in your stomach as warmth, peace, excitement, or security. is this view from my last Instagram post. 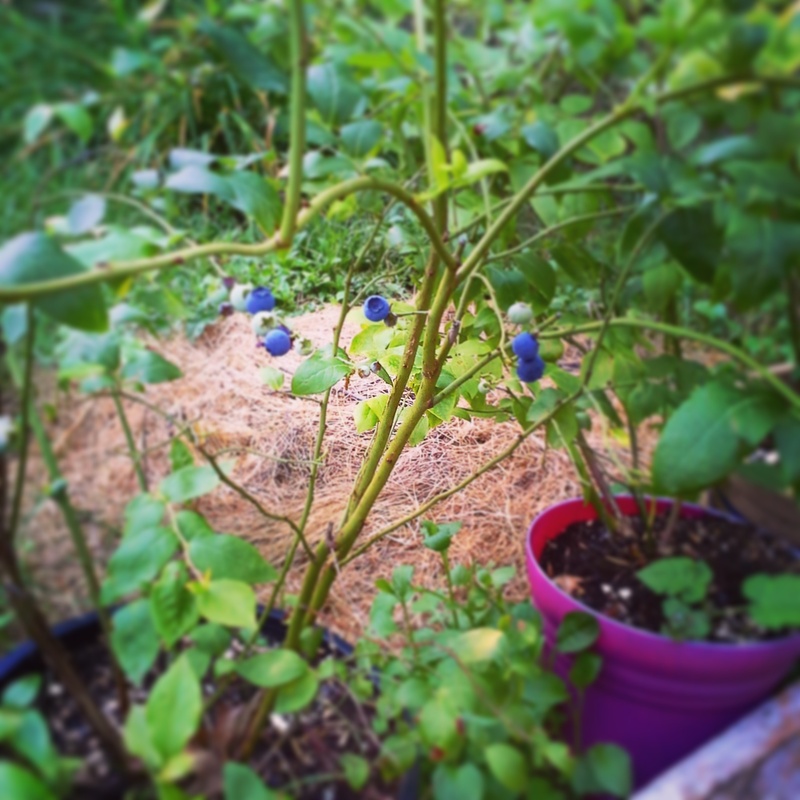 A family friend ended up with way too many blueberry plants last year, so he shared. There is something special about growing your own food, isn’t there? We’ve gotten in some garden beds this year; we have lettuce and kale and some other cool veggies. Got our first strawberries of our over-wintered plants, although the raspberries didn’t produce anything this year. I thought raspberries fruited (ripened?) later in the summer, maybe you’ll get some yet. My poor serviceberry tree didn’t flower much this year. I’m only going to get about a 1/4 of a cup of berries. *snivel* So I will relish them 2 or 3 at a time! 3 a day isn’t bad! Better than none-a-day. Meep! There are only three unripened berries left!!!! I thought the storm knocked them off but couldn’t find any on the ground. So some critter must have gotten to them first. While I don’t normally begrudge them food, I was really looking forward to picking them today. *sigh* Let’s just hope they’ll leave me those last three!